The stars were in alignment for me on Saturday and I was able to spend the whole day outside for the first time this year. I came in with every bone aching, nettle stings on my hands and a great sense of achievement and satisfaction. I have whittled away at the winter jobs over the last month, I'm not saying they are all done, but I have certainly made better progress than last year. Winter is not over yet though, but the weeds are starting to grow so Spring must be on the way. I've started a very few seeds but we are promised a cold snap in the next few weeks so I am not getting carried away. I don't want lots of leggy seedlings and no-where to put them. Our safe planting date is still at least 3 months away so patience is necessary. In the meantime I've forced spring on a bit with this vase. About 2 weeks ago I brought these Forsythia twigs inside after reading that you can force them to open early, particularly on Chloris' blog. I read that on the 5th Feb and sometime in the next few days I cut these branches. They really were in very tight bud but have opened up so very quickly. It wasn't easy to get a good picture but here you can see the grey outside and the sunshine inside. I don't often have anything big enough for this tall, heavy glass vase. Interestingly, the buds on the Cornus and Leycesteria in last week's vase have also started to open. I'm keeping them so see how far they go and if I can use them next week and perhaps add something else! I'm joining Cathy at Rambling in the Garden for In a vase on Monday. She encourages to look around to see what we can bring in to put in a vase, jam jar, jug or teapot, as she has used today. There is something so very cheering and delightful about blooming forsythia branches! Love their simple beauty shining through with a clear plain vase! Thank you, yes very cheering. Your Forsythia is a very pretty colour; sometimes it is a bit brash for me but this is lovely. It was inherited so I don't know any detail apart from the fact that it is sunny! The Forsythia look pretty in this glass vase. The color so cheerful for this time of year. Happy IAVOM. Thank you, it cheers up all the grey. Oooh, I'm going straight out to pick some forsythia! Do it, and I'm going to cut some more. Love the way winter light shines through the vase. Those three stems are just perfectly poised. Thanks, it's a lovely vase, I need to grow more taller things. Oh how good to have somethng suitable for this lovely vase - I have afew vases like tat as it is rare that i have a reall tall IAVOM. The forythia is perfect in it, and Chloris' post made me look at in a new light ie more favourably! Good to know that you have been able to get stuck into tasks again - it's a good feeling, isn't it? Thanks, it's a great feeling and good also to be able to share with people who understand. Lucky you to get some time in the garden....it is warming this week but is going to rain so the garden will be soupy from rain and melting snow....still winter here too! I love forsythia and these are lovely....I need to cut a few and bring them in this week! Thanks for the reminder. The weather certainly makes it difficult. We have had our share of rain (and then some) so it's all pretty muddy but there is always something I can do. Hopefully you will get some better weather soon. A beautiful early taste of spring on your windowsill! Temperatures have fallen below freezing here and are predicted to stay there for the next few days so gardening tasks must be put off until it warms up a bit. I'm glad that you got to spend a whole day outside! Back inside with hot drinks and gardening catalogues then! A whole day outside working in the garden would send me in with every bone aching too, but I'd love to be able to get the winter garden cleared up. I've made some progress, but work has been suspended temporarily by snowy cold weather. 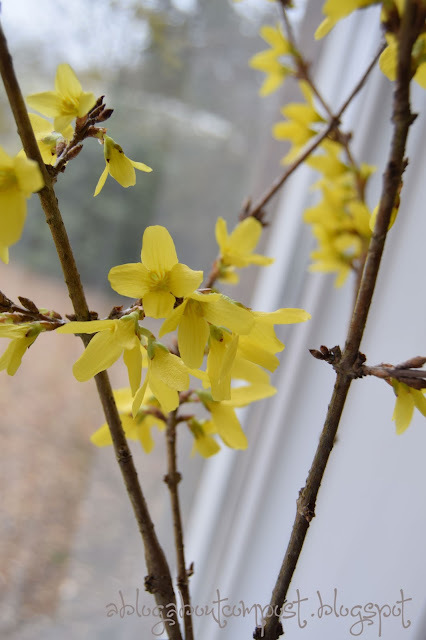 Love your jar of Forsythia! A bath can work wonders for the aches but I was pretty tired! I find that time, energy and good weather have rarely arrived at the same time. We have not had snow just lots and lots of rain. I was surprised to see your comment that your safe planting date is still 3 months away. We DO have VERY different climates! I love the forced blooms. It must be wonderful to watch the flowers open practically before your eyes. You said it! but isn't it interesting to learn about other climates? I was surprised myself that it was so far away and had to double check. It's easy to get carried away as the days get longer but we certainly get frosts in April and sometimes early May. So very pretty! Love the beautiful flowers and awesome photo! I was out there on Saturday too Alison - it was most satisfying but as you suggest winter still has a sting up its sleeve. It would be easy to get carried away but apart from starting a few half hardy annuals off in the propagator I plan not to sow anything until the end of March. 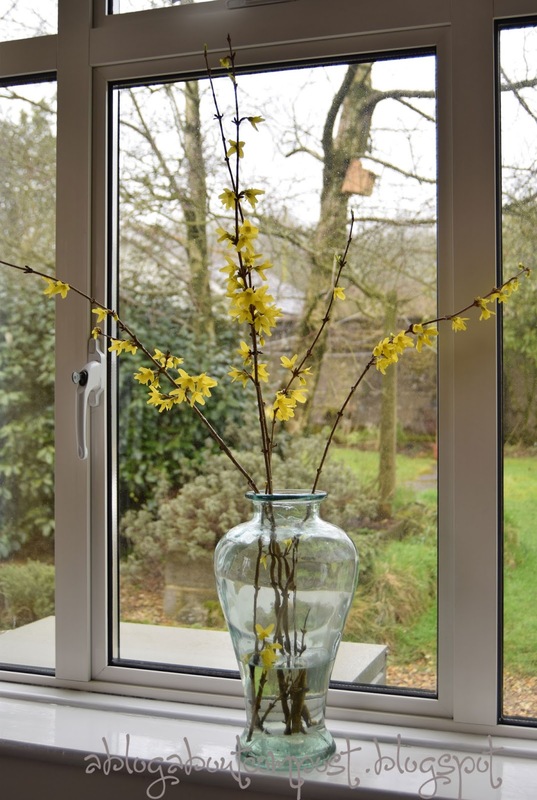 Your vase really makes an impact and the forsythia stems look fabulous. Will be interested to hear what the leycesteria prunings get up to. It is so good to be out again but there is plenty to do without sowing. Frost is forecast so I'm still being patient. Your simple arrangement is delightfully cheery at precicely the time of year we all need to be cheered along a bit. Lovely! I too adore bringing branches into the house when in bloom. Green and white In a Vase on Monday.